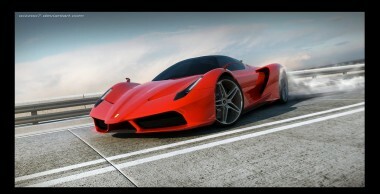 The LaFerrari is a limited production Hybrid sports car built by Ferrari. Unveiled at the recent 2013 Geneva Motor Show with much excitement. With a total weight of only 1225kg and only 499 ever being built, this is a rare collectors piece to have in your stable. LaFerrari’s mid rear mounted 65° V12 Internal Combustion Engine has a 6.3 litre (6262 cc) capacity producing 800 PS (588 kW, 789 bhp) @ 9,000 rpm and 700 N·m (516 lb·ft) of torque @ 6,750 rpm. It is connected to a 7-speed dual-clutch transmission and the car is rear-wheel drive. The car is equipped with carbon-ceramic Brembo discs on the front (398 mm) and rear (380 mm), with the tires measuring 265/30 R 19 and 345/30 R 20 respectively. Ferrari states that the car has a top speed exceeding 350 km/h (220 mph), and that it is capable of reaching 100 km/h (62 mph) in under three seconds, 200 km/h (120 mph) in under seven seconds, and a speed of 300 km/h (190 mph) in under 15 seconds. Ferrari also claim that the car has lapped its Fiorano Test Circuit in under 1 minute and 20 seconds which is faster than any other road-legal car Ferrari has ever produced. Now,the question is…. Has anyone from Australia placed an order?